I had dinner with Captain John last night. It was extraordinary meeting up after forty years; a lifetime had whizzed by. 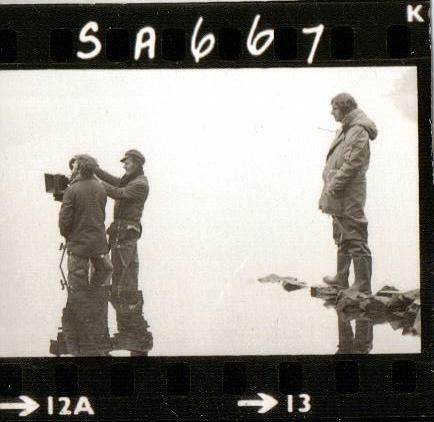 Tall, with dark hair, Simon West is no longer recognisable as John Walker but he looks back fondly on our time making the film of Arthur Ransome’s book Swallows and Amazons in 1973, when we spent seven weeks of the summer term on location in the Lake District. To my surprise he doesn’t remember being cold at all. I claim that he was given a few more clothes to wear than me and had more to concentrate on. He was at the helm whilst I was a mere able-seaman in Swallow. He said that he hated it when she was wired to the pontoon and he had to pretend he was sailing. Simon West and Suzanna Hamilton sailing Swallow from Peel Island where Sophie Neville stands shivering on the shore. Was this shot filmed from a camera pontoon? Simon thought that I probably remember more about the experience than he did because my mother was there, chatting about what was going on every evening and naturally re-enforcing the shared experience. ‘I must have kept a diary, as it was part of our schoolwork, but I haven’t seen it since. I’ll look in my parent’s attic.’ Simon thought that it was his mother who put together an album from the black and white photos that Richard Pilbrow gave us after the filming. 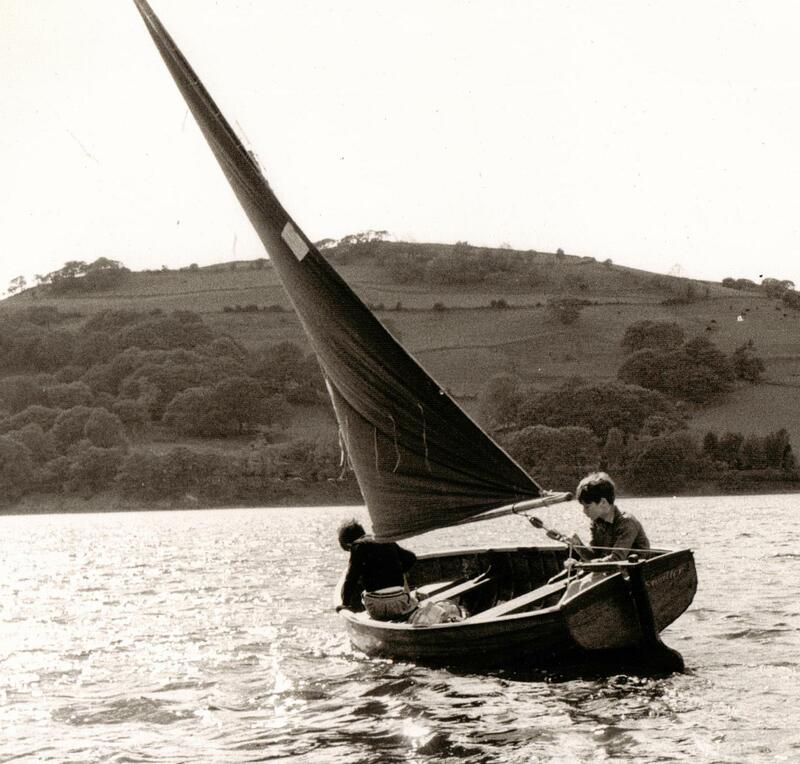 Simon West as Captain John sailing Swallow near Peel Island on Coniston Water. Sten Grendon plays the Boy Roger in the bows. Simon said that he remembers more about filming the six-part BBC serial, ‘Sam and the River’, in which he had the title role in 1974. Much of it was shot on the Thames Tideway east of London. ‘Of course all those places have changed enormously since then, whilst the Lakes are very much the same. I have never been able to find a copy of that series, which is a shame. I’d love to see it.’ We can’t find a copy in English, but there is a version in German entitled ‘Tom und die Themse’ currently for sale on DVD here. 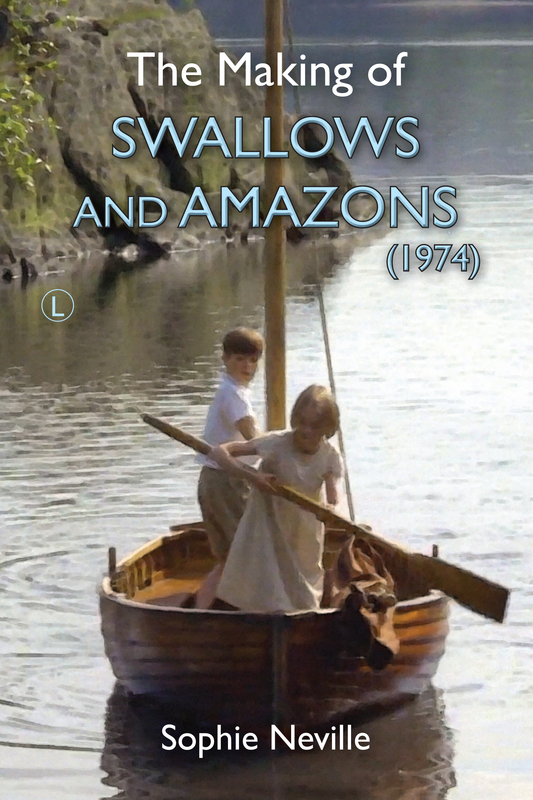 Simon’s own children grew up watching Swallows & Amazons, which is still broadcast once or twice a year on television. He said that when they went to see the Warner Bros. Studios in Hertfordshire where much of the Harry Potter movies were made he felt hugely appreciative of the fact that we had been out on location the whole time, rather than boxed up on a film stage, acting against a green back ground. Simon did remember the great Parker coats that Richard and Claude found to cope with the Cumbrian weather. So do I. My father bought one too. They were blue-grey and enormous, lined with fake sheepskin, their hoods edged with Eskimo-like fake fur. Suddenly the cogs of close association clicked in. Simon tossed his head in a certain way that I recognised as his own expression of humour. He said that he was really pleased that Bobby Moore chatted to him at the film Premier at Shaftesbury Avenue. Simon said that he had become very attached to his Parker fountain pen from Aspreys, engraved with the words ‘Swallows & Amazons- 1973’, that Claude Whatham gave to each of us as a gift after the filming. ‘Stupidly I left in the boot of my car when I was in Paris, aged about twenty-seven. It was stolen with a load of other things.’ I had lost mine too. I dropped it on a footpath somewhere in Durham. ‘Oh, sailing dinghies. It was good to know I had £500 in the bank around the time I was heading towards the British Championships. You know, at first we had ply board hulls but the time came when I needed to buy a fibreglass boat.’ It was with this that he became the National Optimist Champion. We agreed it was money put to good use. After the age of about sixteen, Simon’s family became interested in orienteering. Maps seems to have had a strong influence on both our lives. Simon West as John Walker studying the chart at Holly Howe before the voyage. Simon and his wife now have four grown children. ‘We are split down the middle: three of us sail, three of us do not.’ But every year he takes the family up to the Lake District to go fell walking, something they all enjoy very much. If anyone sees a brushed steel Parker pen on eBay engraved with the words ‘Swallows & Amazons 1973’ please let me know. I’d love to be able to return it to Captain John. As always, Sophie, you know just what we eagerly want to hear about! How great to hear that ‘Captain John’ is flourishing and did well. It was great to see him. I love these black and white photos from his album. They are some of the best ever taken and yet so few people have ever seen them. It would be lovely to hear from them, but I didn’t want to put them under any pressure. Thanks for this update on the Captain. He was the missing link in your reminiscences and I’m pleased to know that he and all the Swallows (who’ve given us so much pleasure) are happy and doing well! Wonderful news, Sophie, that you have finally been reunited with Simon after forty years and that he’s still around and has done so well. You should have taken a photo of him so we could all see what he looks like now. I will keep a constant lookout on eBay for one of those pens, but I don’t think there’s much hope of ever coming across one. However, you never know…one just might turn up one of these days. I would also like to see “Sam and the River”. According to the Lost Shows website, the series still exists in its entirety, so it may be released on DVD one day. Oh Wow! I wonder if the BBC or Revelation Films could be persuaded to sell the DVD of ‘Sam and The River’. Do write to them and ask! Can you give me the lost shows link for ‘Sam and The River’? I have looked but to no avail. It would be wonderful to be able to pass it on to Simon. Well done!! How great that you managed to meet up. Let us hope that the attic yields more treasure! The photograph of John map-reading is quite superb with lovely lighting on the face, and the sailing shot of the boys is good too. It does not matter that they are not in colour. Somehow, I feel that Kit and Lesley will not make contact. But we enthusiasts must not be greedy, I suppose. You mentioned that Kit disliked all the publicity and perhaps she has put all that behind her, and is keeping a low profile. As I remember it, Kit was not hugely interested in public appearances, but I’d love to see her again, so I hope she makes contact somehow. I think Roger’s quite right about Kit – it must have been quite a burden at her age to be so much the focus of everyone’s dreams and aspirations; but Lesley, the perfectly-cast cheerful, guileless younger sister – might she one day surface? Lesley – we won’t bite! Lesley was a little bit older than the rest of us, so quite naturally had a bit more confidence and understanding. She did very well. The part of Peggy is more difficult that one would at first envisage. Super article. No picture of you and Simon together at dinner? I’ve watched the film many times with daughter and 3 grandchildren who all love it, as I do. Have all the Arthur Ransome books still. Thanks or keeping it alive with your memories. Thank you for taking the time to post a comment. You must let me know if your grandchildren have any questions – or if you do. We did ask the waiter to take a photo but I’m afraid he pushed the wrong buttons on the camera. I’ll see if anything is salvageable! I suppose it was rather an extraordinary experience to share. Very different from being at school together. The focus and exposure was acute and there were only a few of us in the same boat – literally and on a broader scale. I totally agree with Elizabeth Jolley – these little vignettes that you write about the people and the experiences that you had take us right into that magical ‘fiction of a fiction’ world. And I’m intrigued by your comment that Peggy’s part is harder than one might think – I do agree – she has to be a person, not just a foil for Nancy, and needs her own ‘back story’. In some of the ponderings in the TARS Mixed Moss about the children’s future, one writer suggests very plausibly that she (the book-Peggy, not Lesley!) becomes a sailing instructor and marries John! I was surprised also to hear that Peggy had a difficult part. Her wide-eyed enthusiasm seemed so natural and a perfect foil for the rather dour Nancy. I think Peggy would make a much more acceptable wife for John than Nancy, being domesticated, undemanding, and thoroughly at home on the water. Life married to Nancy? It doesn’t bear thinking about! Tee-hee, Roger (BTW, I’ve just bought your book). I wonder (unkindly) whether the Nancy-John scenario is the product of wannabe-Johns dreaming of attaining Nancy: no chance! Also in Mixed Moss was the entertaining suggestion that Nancy marries Tom Gudgeon – well, goodness me. But meanwhile………. Sophie, do give us some of your usual fascinating insight into the demands of being the Peggy character. In the film, Peggy was given quite a bit of factual information to impart, which is always difficult to do naturally but Lesley Bennett did well. You’re absolutely right. I do a bit of acting, and an important thing is to work out what your character’s FOR, which includes providing vital info; and if so, you work out how and why your character wd be delivering it, and form your character around that. V interesting – must re-look at the film and watch how Lesley does it – seamlessly, evidently, as I don’t recall her ‘acting’! I think she did it by becoming the sort of cheerful person who guilelessly chatters about everything and anything. She needs three cheers for her work in the film! I am so hoping that Lesley Bennett will somehow make contact with me. Here is the link, Sophie. I’m afraid that unless it’s “Doctor Who”, or “Only Fools and Horses”, the BBC are pretty hopeless at releasing their vintage programmes on DVD. They’ve junked most of their stuff but “Sam and the River” is still in their vaults. If it had been an ITV programme, Network would have released it on DVD by now. Thanks so much. I’ll pass it on. Oh, dear! Marvelous, isn’t it? You wait forty years for a long awaited reunion and the waiter doesn’t know how to press the shutter button on the camera. You couldn’t make it up. Let’s hope he managed to get off at least one shot. By the way, Sophie, when I attended, as a guest, the launch of former child star Bobby Henrey’s autobiography at the Regal, Tenbury Wells, in Worcestershire, on Friday, September 6th, I was chatting to another guest who looked to be in his sixties who told me he was a former child actor in films and that he knew you very well. Unfortunately, I didn’t get his name, but I did manage to get a few photographs taken of me with Bobby Henrey. Oh, you must try and remember who the chap in his sixties is! Let me know if he is in any of your photos. I’ve just read your excellent review of Bobby Henrey’s book. I must get a copy. I’m sure you’ll be very impressed with it, Sophie. He has obviously inherited his late parents talent for writing. He’s not on any of the photos, Sophie. But he spoke with an English accent and had grey hair (well he would) and, because he was obviously at least ten years older then your good self, I guess he would have been a child actor in the 1950s or 1960s or so. We were discussing the 1973 “Swallows and Amazons” and your excellent website and he told me he knew you personally and that you were a utterly charming lady. Sorry I didn’t get his name, but if you know someone who fits that description, ask them if they were at the Regal, Tenbury Wells, on Friday, September 6th, and it’ll probably be him. People attending the event were from all over the place. Come to think of it, if he peruses this website as he told me he did, he might recognise himself from this post and tell us it was him and who he is. You should send in a correction to Simon West’s Wikipedia entry. It fails to mention his role in Swallows and Amazons! This is Simon West’s imdb page. I think they have his place of birth incorrect. There is another Simon West of his same age who has become a Hollywood film producer.